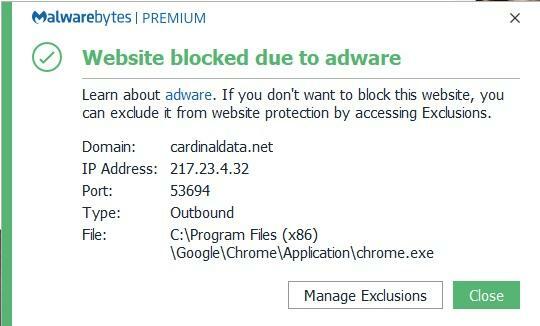 This morning I started getting MWB popup for blocked adware. It pops up just about every time I load a new webpage or open a new browser (Chrome) page. I ran the AdwCleaner and restarted the computer, but the popup barrage persists. I performed a full scan with MWB, but without effect. What can I do to get rid of this problem. Same for me. Ran MWB, Hitman Pro, Zemana...no effect. Reset Chrome. Deleted history, cookies...no effect. I just had the same issue with Cardinaldata.net. Surfing for answers I found one that worked for me! Chrome/settings/more tools/extensions/Remove Flash Player. It worked! All gone now. I removed Chrome and re-installed and it seems to be working. I'm assuming that removing Flash Player would have worked since uninstalling removes all of the extensions. But Malwarebytes reports "No threats detected!" I assume I must have some malware on my machine or I wouldn't get these constant warnings, yet Malware is not finding the virus. What can I do? I`m having the same exact problem. Same site cardinaldata.net. I deleted and reinstalled Chrome but no change. Is anyone of you using McAffee and had a message to update? Also having this on nearly every page. Appears to hide youtube UI as well, the sidebar specifically. Hoping we can figure this out soon, kind of annoying to see a popup every time I go to a new page saying it blocked something. Idk if it's something to do with chrome itself, haven't tried other browsers yet, but I'd prefer to not have to switch since most of my passwords are saved to google, even though really I know that's probably a bad idea. in your chrome settings ,click 'more tools', then click 'extensions' and remove 'flash player'. I also had the problem of constant adware being blocked though I only added Flash Player a couple of days ago. Removing Flash Player seemed to work. I have only gotten one message since I removed it. It didn't affect FireFox, just Chrome. I removed the Flash Player extension, then rebooted my laptop. I've only had one adware message since then, so I think I'm cured. Okay, this worked for me: Chrome settings (3 vertical dots), more tools, extensions. Then remove flash player. Not sure what the ramifications will be long term but that got rid of the adware for the moment. That's what I did but I had to reboot before the adware messages stopped. I would guess the procedure would be slightly different depending on various software versions. The real question - Is this a Flash player problem and if so what is Adobe doing about it? I think to find out you will have to advise them of the problem. Did you need help or is everything okay? Sometimes extensions just become corrupt. It could be the setting is still there but without Flash it cannot launch. Try reinstalling Flash and see if the issue returns or not.